At the Target step of the wizard, select the destination for disk restore and format in which you want to save the resulting virtual disk. 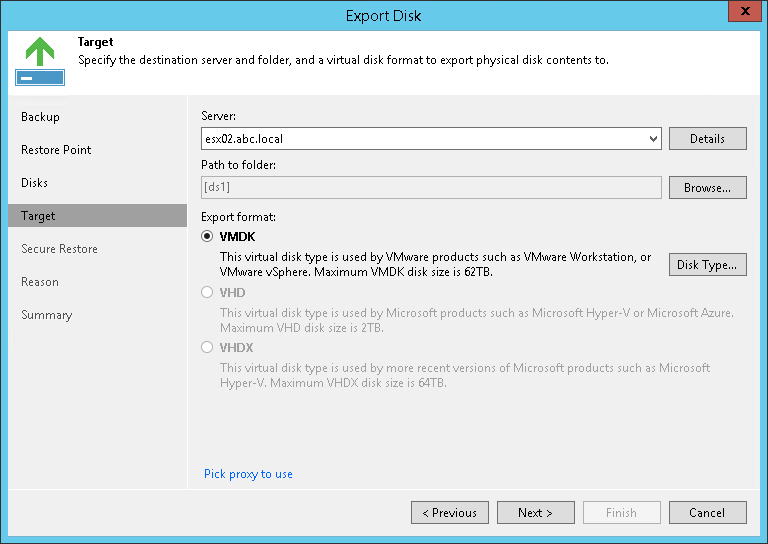 VHDX — select this option if you want to save resulting virtual disk in the Microsoft Hyper-V VHDX format (supported by Microsoft Windows Server 2012 or later). [For VMDK virtual disks] Click the Pick proxy to use link to select backup proxies over which disk data must be transported to the target datastore. You can assign backup proxies explicitly or instruct Veeam Backup & Replication to automatically select backup proxies.